A common misconception about hyperconverged infrastructure (HCI) is that because data services are software-defined, the hardware doesn’t matter. 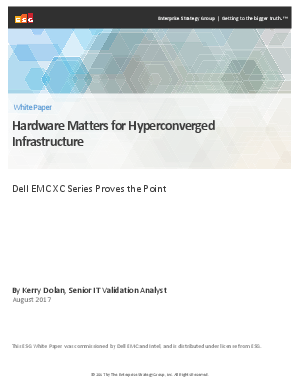 It’s easy to see why—the software driving HCI solutions such as the Dell EMC XC Series (in this case, Nutanix software) is exceptional. It efficiently manages data and communications across a cluster of nodes and storage tiers, keeping the cluster and virtual machines (VMs) up and running, delivering optimal performance and availability. Software-defined infrastructure is changing the way data services are delivered, making companies more efficient and agile, and reducing costs.